This week you will not have to drive far to appreciate the beauty of the Underwater World here on Okinawa. The junkyard is one of the most popular, and local, dive sites near Kadena. Remember divers that this week there will be a good reason to drop in on the junkyard and take a close look at what I am describing because that’s where this week’s ‘Dive Site Surprise,’ presented by Fathoms Dive Shop, will be found. The diver that finds the Dive Site Surprise will win a day of boat diving in the Kerama Islands. Site Location: As you drive north on Highway #58 from Camp Foster turn left at the light just before Kadena Gate #1. Follow that road through the traffic lights until you reach the Sunabe Seawall. Turn right at the wall and follow it past Fathoms Dive Shop until you leave the paved road. A large junkyard will be on your right while the seawall will remain on your left. Continue about 75 yards until you arrive at the turn in the road. The steps, which provide entry to the water, are located just before the bend in the road on your right. Park here. What to expect: Immediately you will notice fewer divers and an easier entry. Enter through the stairs and set a west by northwest compass heading. A short walk across the coral of 30 yards/meters at low tide will take you to the edge of a 20' coral wall. This is an effortless entry. You will dive among large coral heads with an obvious reef wall that you can use as your course reference. There are tidal warnings that you should be aware of for this week and into the weekend. Large volumes of water are moving across the reefs this week. Before completing your dive planning click over the www.h2Okinawa.com for complete description of this week’s tidal warnings. Recommended first dive: At the edge of the reef fin up and shoot a northerly compass heading that will parallel the seawall. Your dive will take you along the face of the reef and into a depth of 45'. For deeper water turn right into the sand for depths of up to 80'. Most divers enjoy following the wall and poking around in the holes and recesses of the reef. If you turn right you will find a rock and sandy bottom that should yield interesting trails of Auger Shells. Within the hard and soft corals of the reef you may find Tiger and Egg Shell Cowries and the occasional Moray Eel or Octopus hiding out. So keep your eyes open and your flashlight on. Remember to look at and admire these shells, if you find them, but do not take anything out of the ocean and only leave bubbles! Aquatic animals found here: Stingrays are sighted infrequently in summer months. The coral reef yields a nice collage of soft and hard corals of varying colors when illuminated with a dive light at night. Expect to find Clown fish in their anemones as well as the ever popular and most always present Sea Snake. 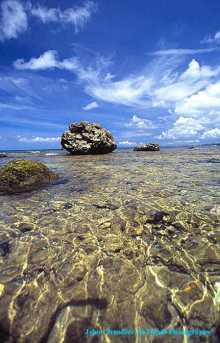 Be watchful for Lionfish, Scorpionfish and Stonefish skulking among the rock and coral in the face and on the reef. Good luck to everyone and I hope you have some fun looking for the prize. See you in the Keramas right after your trip to the Junkyard!